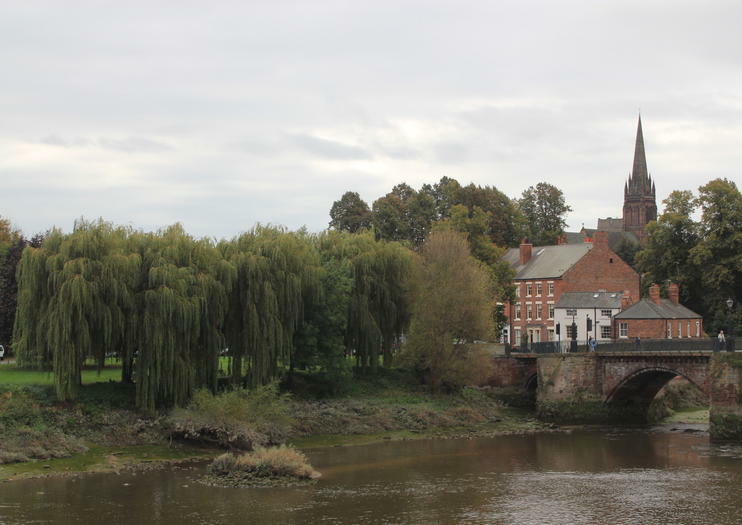 The town of Chester in northwest England was established by the Romans in 70AD making it one of the country's oldest towns. It is also one of England's best preserved walled towns with most of its walls still intact. Visitors can walk the ancient city walls to get a better view of the city as well as the largest Roman amphitheater in Britain and the beautiful architecture of the Chester Cathedral. Another historic part of town is the Rows, a series of Victorian half timbered buildings dating back to the 16th century which now hold shopping galleries. Chester also has the Chester Zoo and the gardens of Tatton. There are plenty of restaurants, bars, and venues that host live music events throughout the town. Within the walls, the town is compact, making it easy to explore by foot and enjoy the charm and history. Not too far from Chester, visitors can explore old stately homes, medieval castles, and the mountains of North Wales. Chester is located 40 miles southwest of Manchester and can be reached using route M56. Alternatively, it is 27 miles south of Liverpool and can be reached from there using route M53. There are plenty of train options from both cities as well. Explore England and Wales over five full days with this transport, accommodation, and day trip experience from London. Perfect if you don’t have your own vehicle, the package makes it easy to discover the highlights of the two countries through guided tours and plenty of free time. You’ll have overnight stays in Chester and York, and discover scenic regions such as the Cotswolds, Snowdonia, and Peak District with a private driver-guide. Discover one of Britain’s most striking heritage cities on an independent day tour from London, traveling by rail through the English countryside to historic Chester. On arrival, use your hop-on hop-off City Sightseeing Bus tour to visit the majestic Chester Cathedral, the iconic Eastgate Clock and the landmark Northgate. Walk the ramparts and climb the towers of the remarkably preserved Roman City Walls, then admire the unique Rows galleries and ancient cellars, crammed with shops, bars and restaurants.